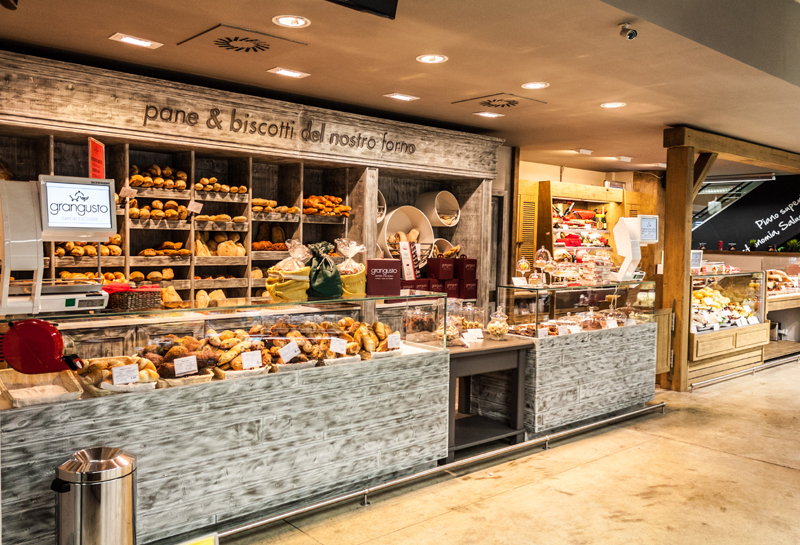 If you want to live a different experience during your stay in Naples, how about visiting the two quality food megastores in the center of the city dedicated to Campania and Neapolitan tastes, Eccellenze Campane and GranGusto? Eccellenze Campane, the first Italian gastronomic pole, has been opened since January 2014 in the eastern area of Naples. In its 2000mq it promotes and enhances the excellent food of the Campania region. Here the best food production of the territory is showed and the Neapolitan culture is promoted. The production comes directly from the producer to the consumer. There are eight areas inside this center: bakery, brewery, pasta, dairy, roasting, pastry, chocolate and ice cream, all of them linked by the authenticity of the product. So the total 700 groceries are displayed in the windows of the structure. If you want, you may take part to the open space workshops, buy the merchandise and participate in the training courses in the Aula Magna. This new place of innovative gastronomy is open every day from 7am to midnight. The other food megastore is GranGusto, a two level shop of 1000mq, open every day and entirely dedicated to the excellence of the Campania region. Its philosophy is to propose a model of healthy eating, respectful of the traditions and cultural identities. On the ground floor there is a bar where you can enjoy a coffee, a quick snack or an aperitif, relax with a food and wine book from the shop bookcase, or surf on the internet thanks to the free Wifi. At the restaurant-pizzeria you may taste the typical and genuine products of the local tradition in a very pleasant atmosphere. You may eat the fragrant bread baked in the wood oven, or the typical soft and thin Neapolitan pizza, the special dishes and the good sweet pastries prepared here by pastry-cooks, all accompanied by one of the hundreds of Italian and foreign wine labels or one of the 45 types of champagne. You can also make use of the take away service. But what makes this place so special is the cool food store on the first level, where you can find both fresh and handmade products of the territory and foreign products, as meat, cheese, salami, fish, bread, national and exotic fruit, vegetables and also gluten-free products etc. They are all high quality products. If you are intrigued, why don’t you come to savour the Italian specialities and the foreign delicacies in this particular place where everything is intended as a way of meeting, enjoying and learning?